Back during training, Dan was looking forward to his actual service, and said (I’m paraphras- ing), “I’m gonna buy a fan and some coconuts, and I’m just going to sit around and listen to Bob Marley.” Little did Dan know his placement would be one of the more challenging jobs assigned to group 81, nor did I appreciate how integral fans would be to my Samoan experience. 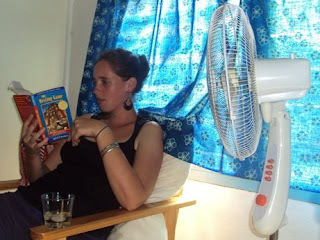 I think if I really tried to get by without a fan, I could, but it would be lousy. Samoa is 14 degrees from the equator, so it’s hot here. Before the missionaries came, a large portion of the population lived a ways up the mountain where the climate is much cooler, and stronger winds aid ventilation. Additionally, Samoans traditionally live in fales, or huts, that have no walls and aerate quite pleasantly. But then the missionaries came, bringing Jesus and the heat. Near the end of training we had a day set aside for shopping so the moving vans could schlep some of our larger purchases to our sites. A few members of group 81 dedicated the day to finding the best fan for the lowest price. Their search yielded the Basix 3-speed fan from Apia Hardware Supply for $75 WST. I believe 12 out of 13 members of group 81 ended up purchasing this fan, and the only reason the 13th didn’t get his was because we’d bought out the store. My Basix fan burned out on its fourth day in use. Paul has been through 3 fans already. When Cale’s broke down, he tinkered with it a little, and got it working again, but now it blows air in the opposite direction. Strange. Reconciling our small monthly stipends with beating the heat with the prevalence of mediocre appliances at many stores in country is a delicate equation to balance. And thus, when Peace Corps come together, one of the most common topics of conversation (along with new ailments and stale gossip) are the struggles and triumphs we’ve had with our fans; such conversations are admittedly menial, but vital at the same time. Koa got a sturdy industrial-strength fan for his huge house. “I’d rather get this one that will last me than have to constantly keep buying new ones.” The point is well taken. My Basix came back to life, but not before I went out and got a new Modyl, which also has 3 speeds and a sleep timer. This new one was $100 WST. I use it as my primary fan, but it’s aging after 6 months’ use. When I turn it on, I have to start it on the highest setting, and even then, you have to watch very closely to see any movement at all. It takes about 5 minutes for it to speed up so it’s actually blowing air, and during those 5 minutes, the motor becomes very very hot. I hope you’re enjoying your weekend. Picture below. 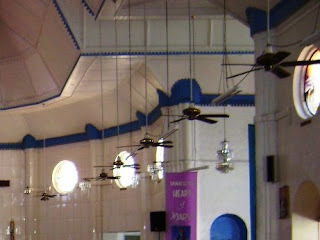 Ceiling fans at the cathedral. Dylan's fan has no cover. This is not unusual. The cover often is necessary when you need to tinker with the inner workings of the fan. Also, I'm told that if I took the cover off the front of my fan, I might be able to start my fan in the same way one might start an airplane's propeller from the 1920s. 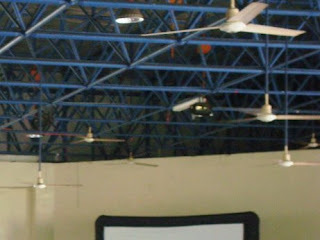 Ceiling fans at the cultural center. 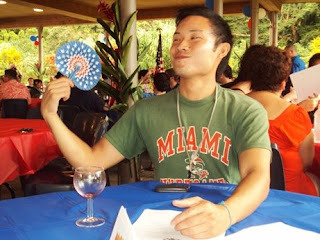 Supy, fanning himself the manual way, at the 4th of July celebration. 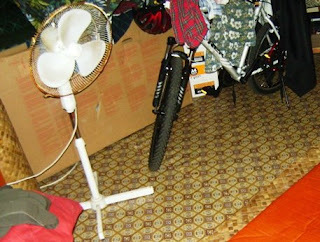 the extreme heat there convinces me that i could not live in Samoa - i go through many fans myself and i live in Canada! i will simply have to resort to visiting - at a resort i suppose!! LOL! My favourite quote thus far in my reading "...Samoans traditionally live in fales, or huts, that have no walls and aerate quite pleasantly. But then the missionaries came, bringing Jesus and the heat."